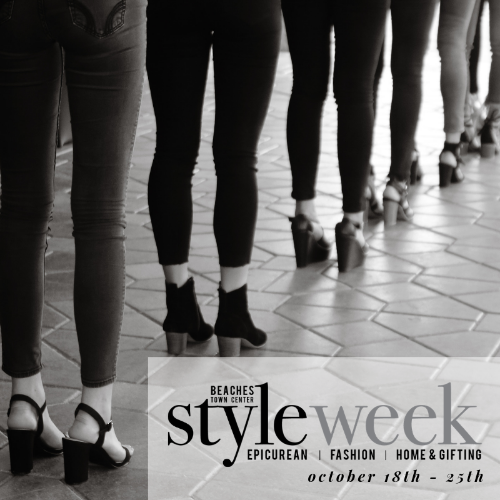 ​Beaches Styleweek & Tour of Homes 10/18 - 10/25 -- Mark your calendars for the premier event for Fall... Beaches Town Center StyleWeek! Join us October 18 through October 25th for a week of all things holiday, epicurean, gift & giving. From glimmering fashion shows to nights of special offerings from select restaurants, there’s something for everyone. join us where atlantic boulevard meets the ocean for a fun fashion show and party to kick-off our week of stylish festivities! bring your little ones dressed up in their spooky best for a morning of fall-time fun with trick-or-treating, crafts and more! check out the neighborhood, featuring cool pads in neptune and atlantic beach. guided tours and VIP packages available. it's sunday funday at the lemon bar, featuring a runway filled with resort wear looks to get you excited for spring! enjoy an evening of fine dining and fashion at participating restaurants. get in the gift-giving mood featuring specials, trunk shows & more! wrap up the week in style at one ocean with style week's grand finale, featuring fun looks for the holidays. show starts at 8 p.m.